Powerfully sad ending. This book really shines with the medieval scenes. Kivrin is a likeable character and Willis does a nice job building a medieval cast around her. It's hard to write too much without giving away the ending (it's the Black Freakin' Death, so draw your own conclusions), but I have to say I did not expect the totality of the outcome. 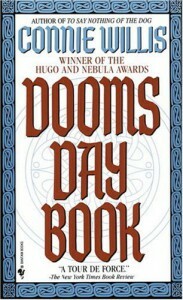 Willis has written what I can only imagine is an accurate portrayal of the Plague and its effects. Most especially the hopelessness it must have instilled in people. It's perhaps worse for Kivrin because she knows what it really is and can't do anything to stop it. The book did slow down a bit with those chapters set in the modern era; I found myself mostly interested in the medieval scenes and those characters more so than the ones from modern times.